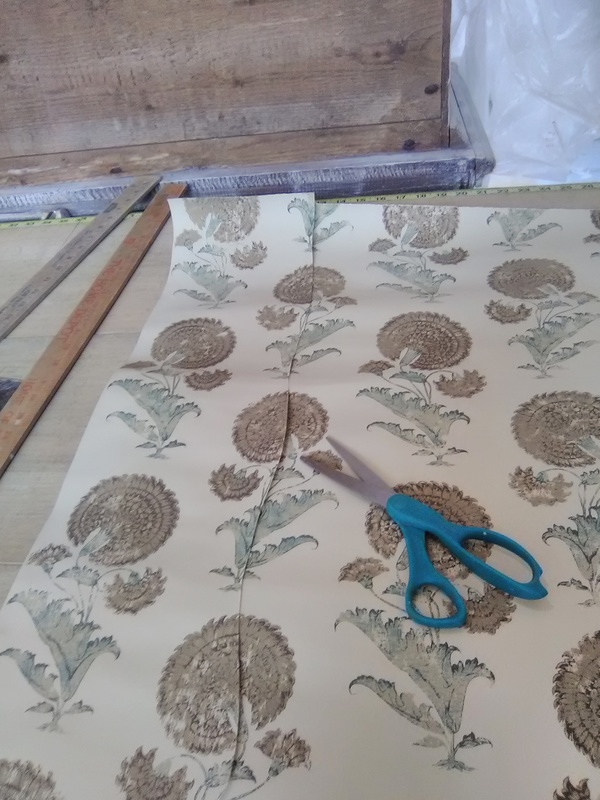 When you hang wallpaper around a room, and your last strip meets up with where you started with your first strip (usually in a corner), the pattern will almost always end in a mis-match. When this can be hidden behind a door or other inconspicuous place, it’s no big deal. 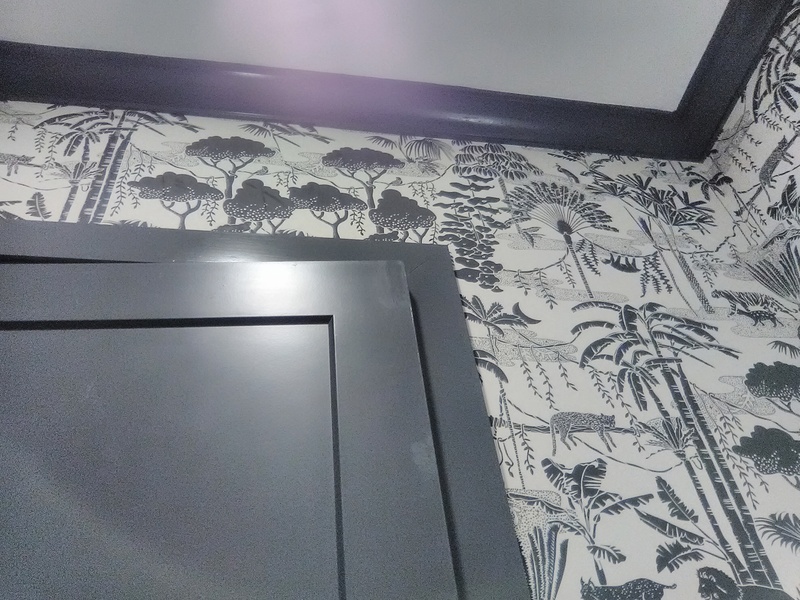 But this powder room didn’t have an obscured corner – all four corners were 9′ high and very visible to anyone standing in the room. I didn’t want to kill (finish) the install in one of the corners – you would have 9’+ of chopped-in-half lions, monkeys, tucans, trees, and etc. 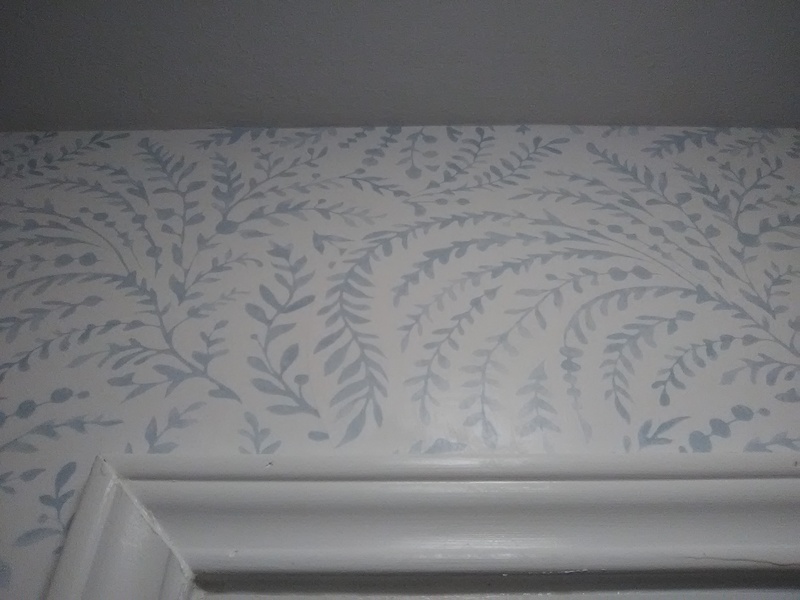 So I killed the pattern over the door. 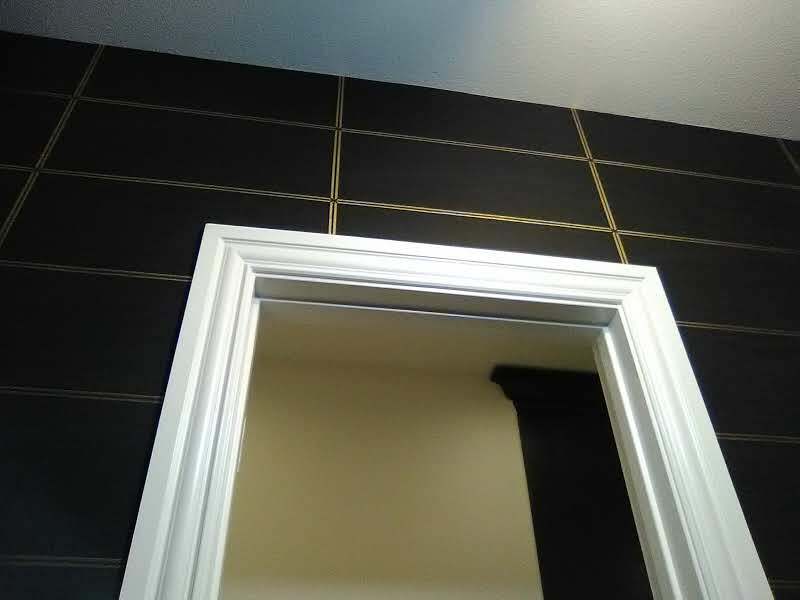 This way, you would have only 15″ of mis-matched design – and not many people are going to be looking up above the door, anyway. 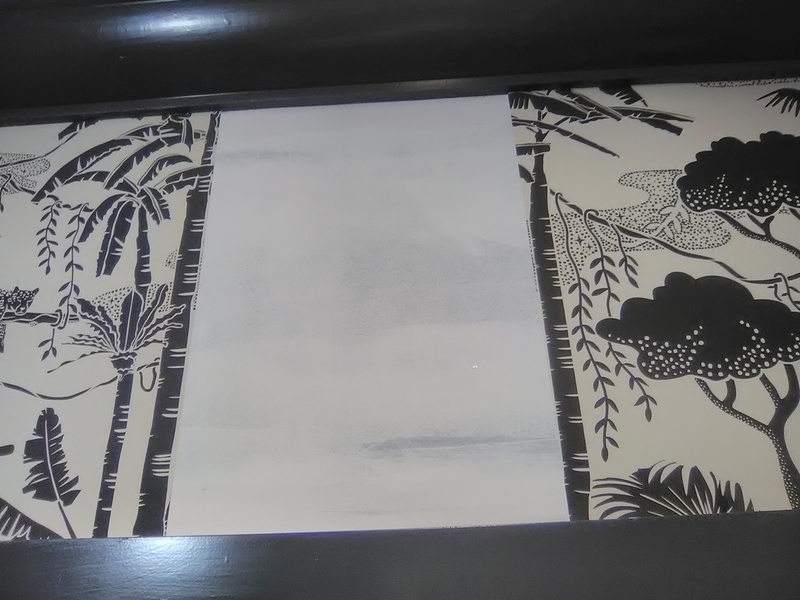 In the top photo, you see the 11″ wide space I need to fill between the first strip on the left, and the last strip on the right. 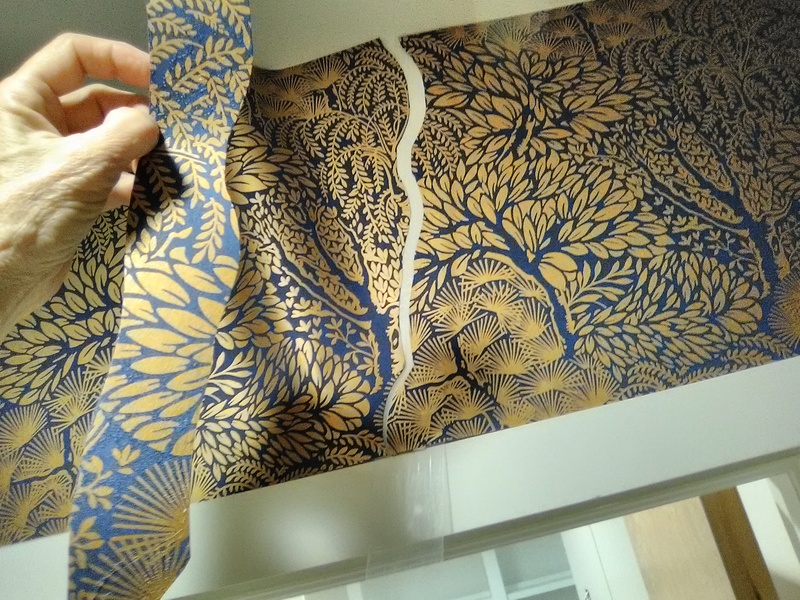 I could have just taken the next strip and cut it off vertically at the 11″ width. But if I had done that, you would see an abrupt break in the pattern. 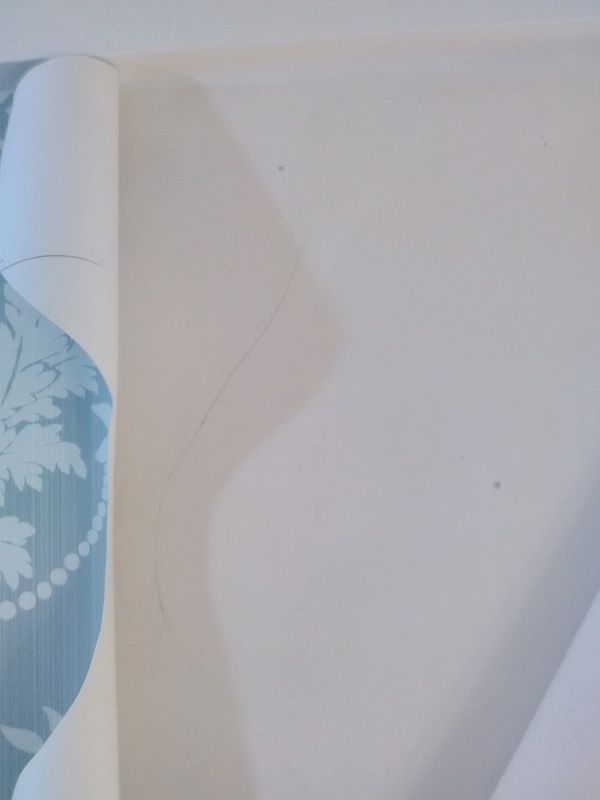 Instead, I did a “weave.” This is where you use a scissors to cut along elements of the design, so they appear to logically mesh with the design motifs on the other strip. If you study the area over the door, you notice that there are a few too many trees. But too many intact trees look a whole lot better than a few trees sliced in half at that final junction point. 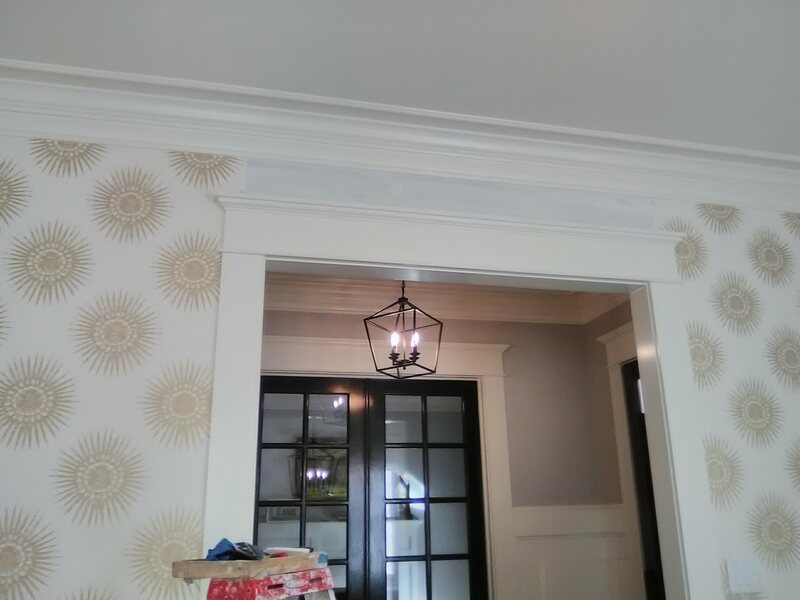 This minor pattern discrepancy over the door allows for all four of the 9′ high corners to have their patterns match perfectly. 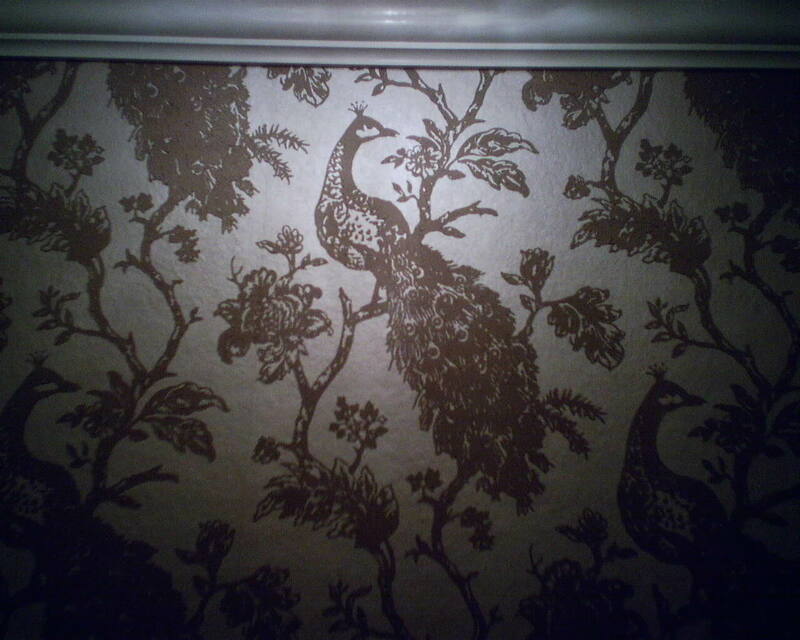 I hung this beautiful tan peacock pattern on a pearlized background in a powder room in the Clear Lake / Seabrook area of Houston. The “kill point” is the last corner in a room, and you will virtually always have a pattern mis-match at that point, so I plan the layout so that falls in an inconspicuous place. Usually, that’s a door that is set close to a corner. 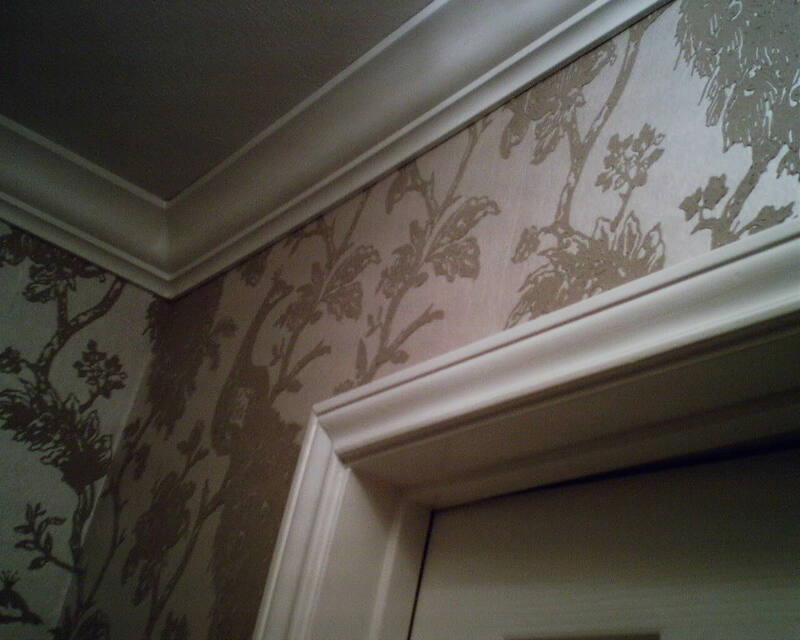 But in this powder room, all four corners were very visible. 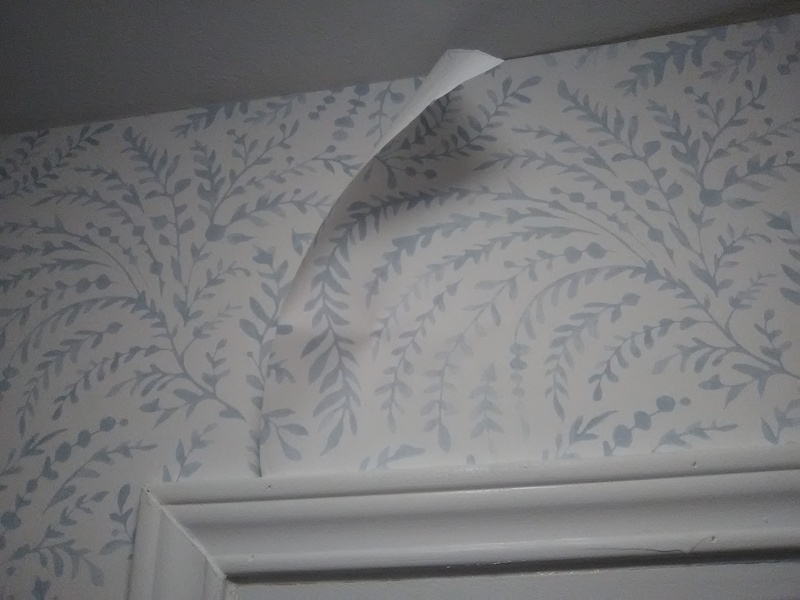 I didn’t want to end in one of those corners, because that would result in a half a peacock butting up against a cut-off tree branch, for the entire 8′ height of the wall. 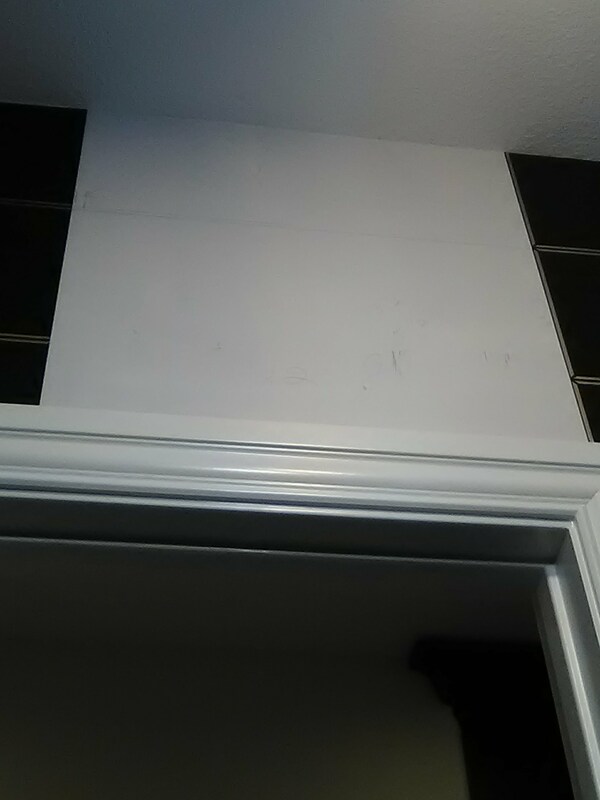 So I put the kill point over the door, where the strip was only 10″ high. 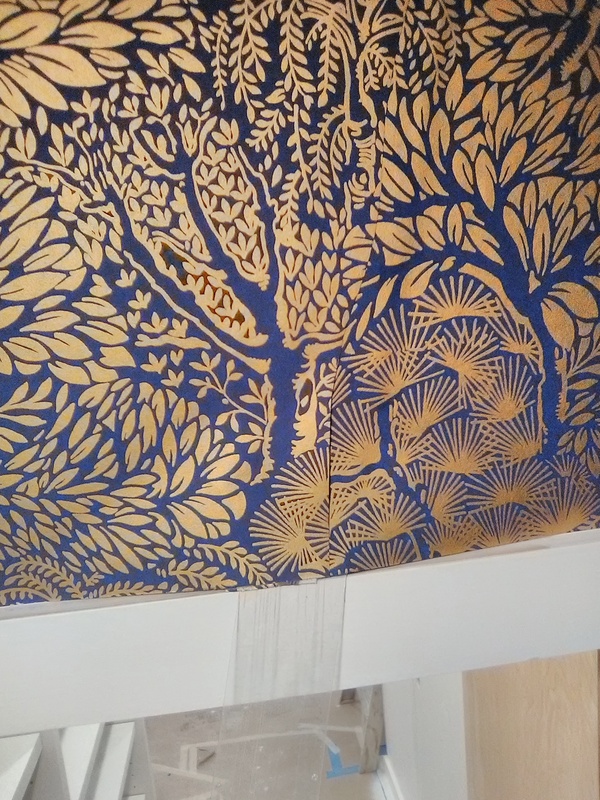 A 10″ mis-match is better than an 8′ mis-match, but I still didn’t want to end up with a chopped up peacock. 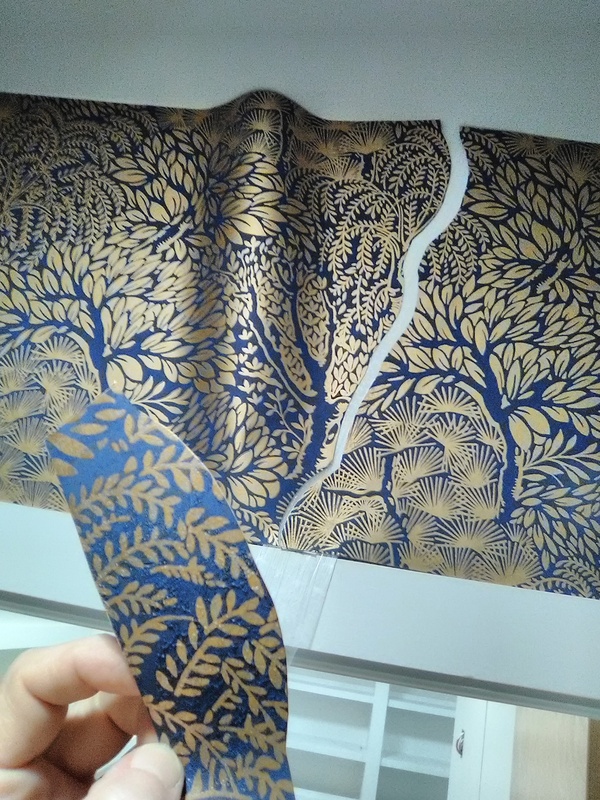 So I fiddled around a little, played with the pattern, overlapped two pieces (with wax paper protecting them from paste), and spliced the two pieces together, using a curved cut instead of a straight cut, so I could cut around the tree branches and leaves, instead of cutting them off abruptly. 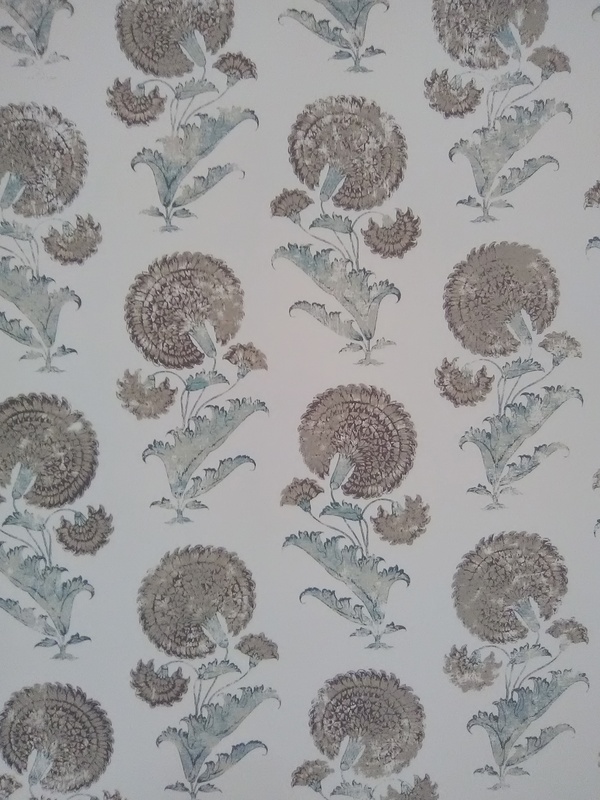 You can see that the pattern motif repeats itself, but that is not too noticeable, in the grand scheme of things, and looks way better than the alternative. 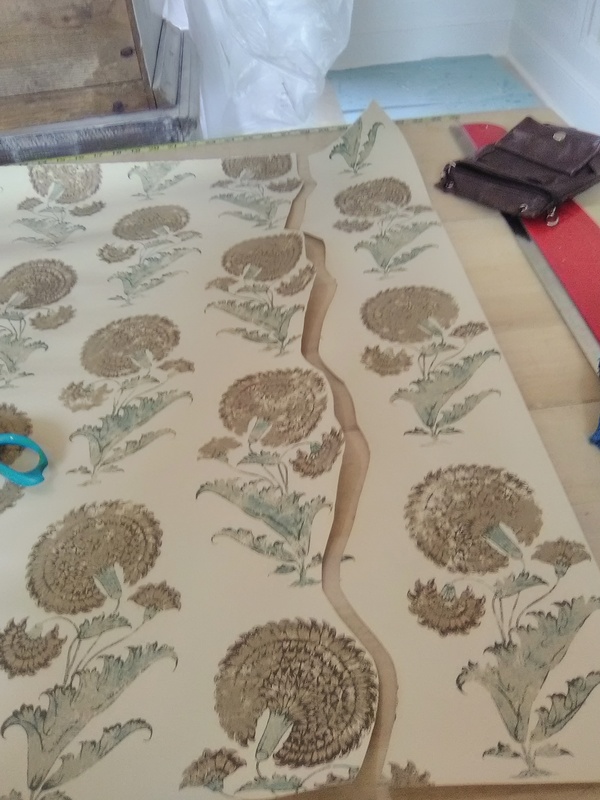 Interestingly, I did a similar trick earlier in the week with another kind of paper, and the technique was entirely different. 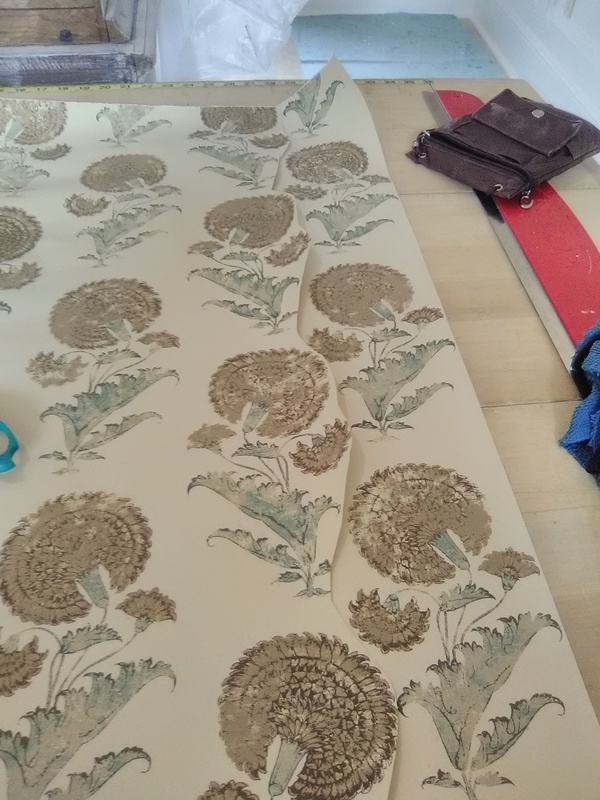 The other paper was thin and could be overlapped and have appliqués applied to it. 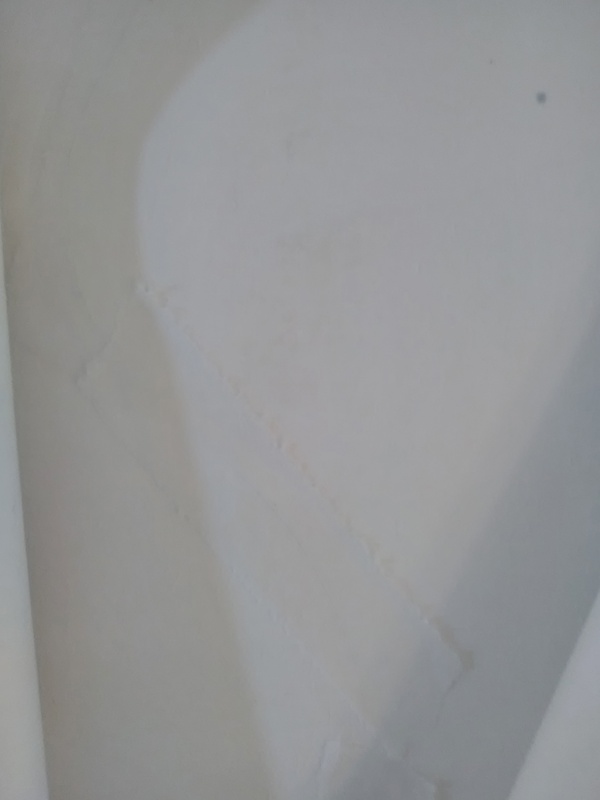 This paper, a thick non-woven with a textured surface, could not be overlapped, so a splice was the best route. 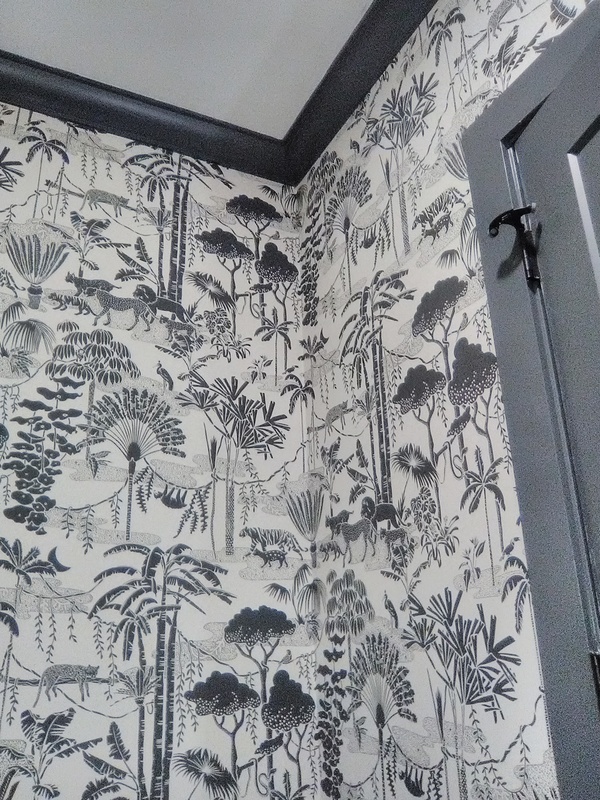 This wallpaper is by Ronald Redding for York Wallcoverings, and was sold by Ethan Allen’s Friendswood (Baybrook) location. Betcha didn’t know they had (free!) design services, did you? 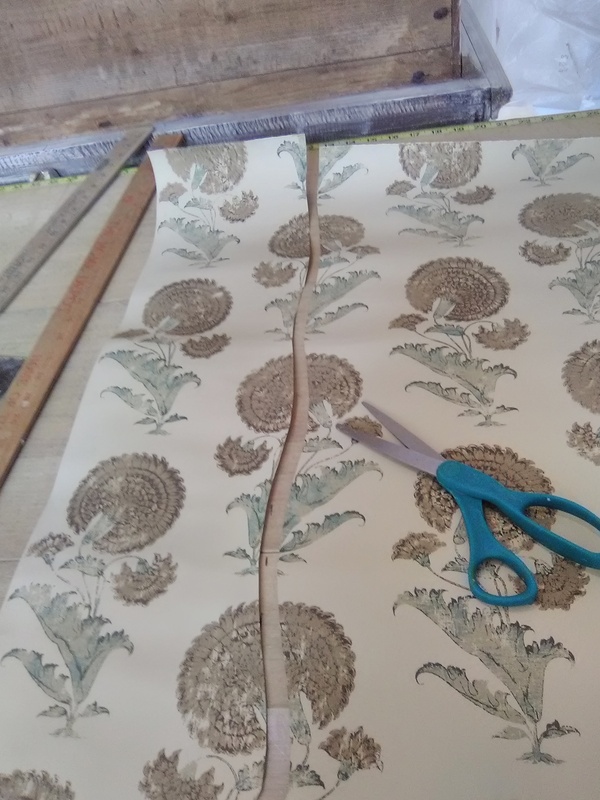 When you wallpaper a room, the last corner – where your last strip meets up with the first strip – always results in a mis-match. We call this the kill point, and we try to hide it behind a door, up high, or in some other not-too-noticeable spot. 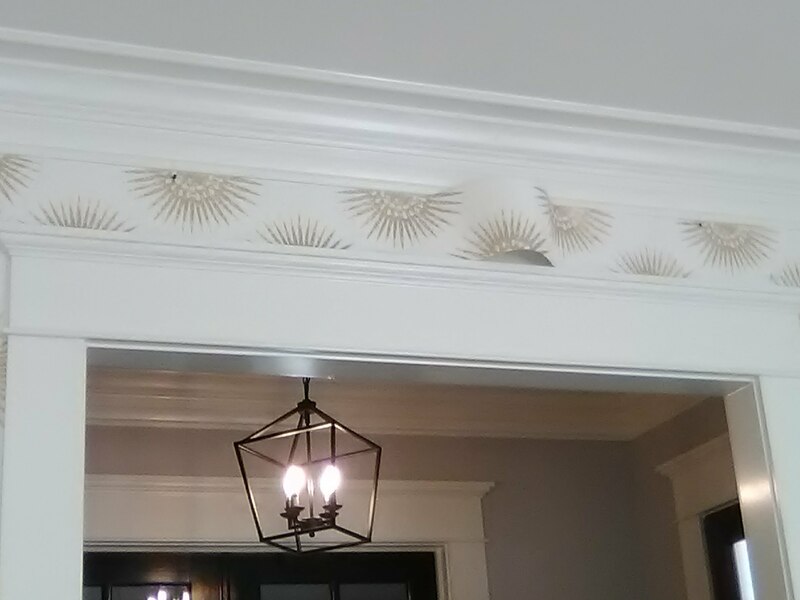 This room didn’t have any “hidden corners,” and I didn’t want the family to live with starburst medallions that were chopped in half. 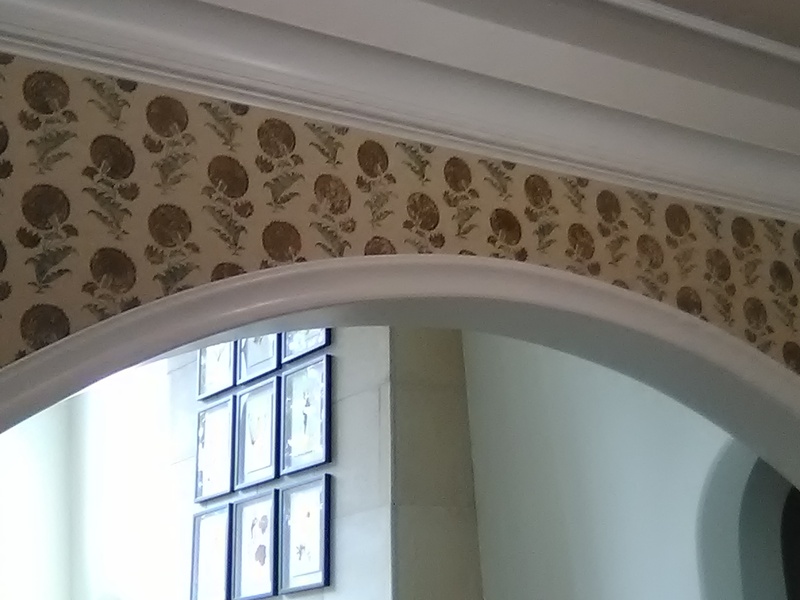 So I planned to put the kill point over the wide doorway leading from the dining room into the entry hall. This was a less-noticeable spot – but still, a chopped-off medallion would be very obvious. 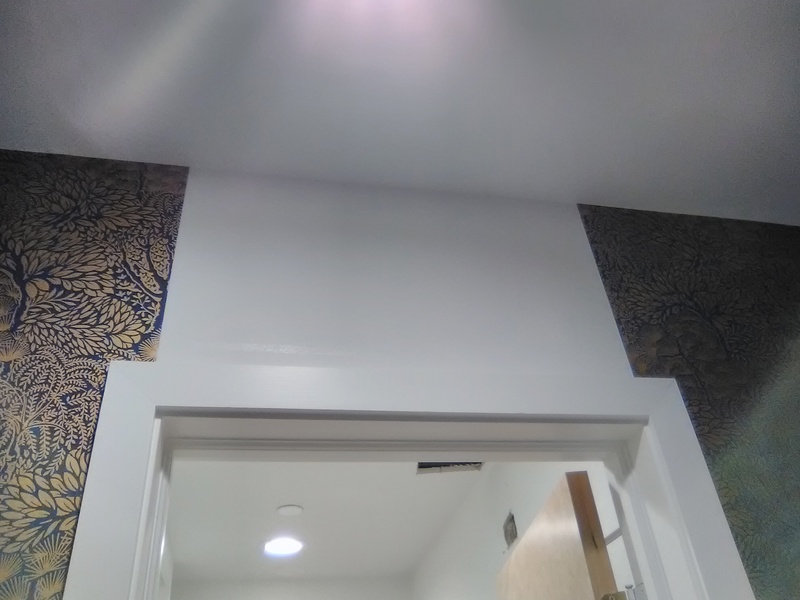 When I plotted the layout, to get the pattern to match at the right and left corners over the doorway, there was going to be an excess (see the “pouch”) in the center of the wall. 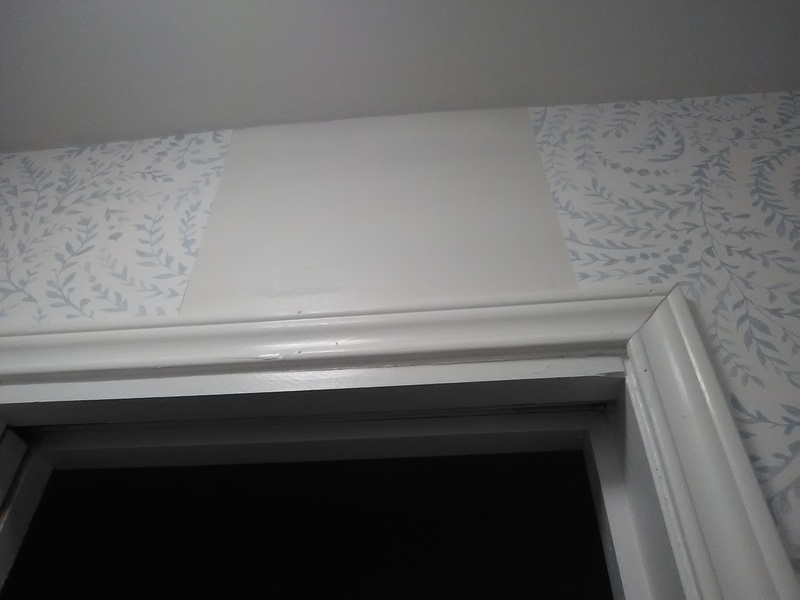 To get rid of this excess, I “shrank” the paper until it fit the expanse over the doorway. I used a straightedge and some careful measuring to remove 1″ (or two star spikes) from each of three medallions. See third photo. When the remaining pieces were put together, you could not detect any pattern mis-match. 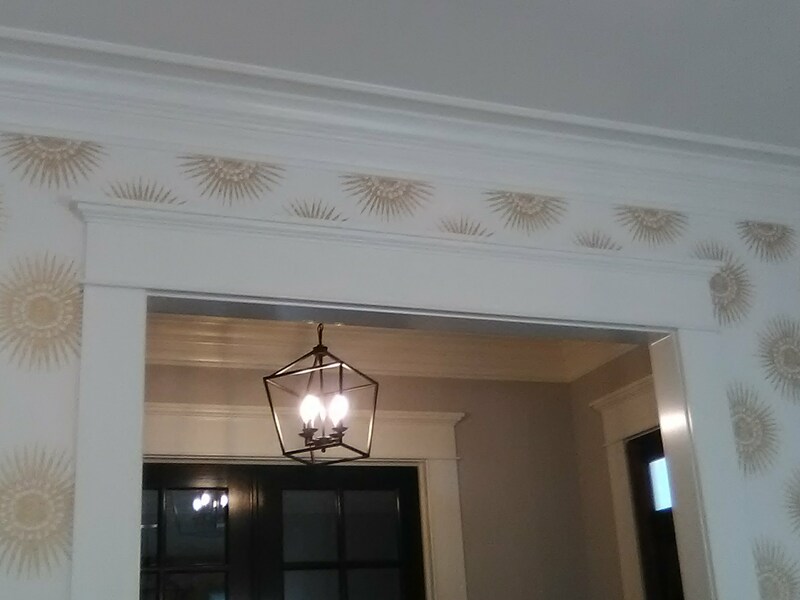 When it was all put together way up on top of the door molding (last photo), it all looks homogenous and balanced. A kill point is the last corner in a room, and it almost always results in a mis-matched pattern. 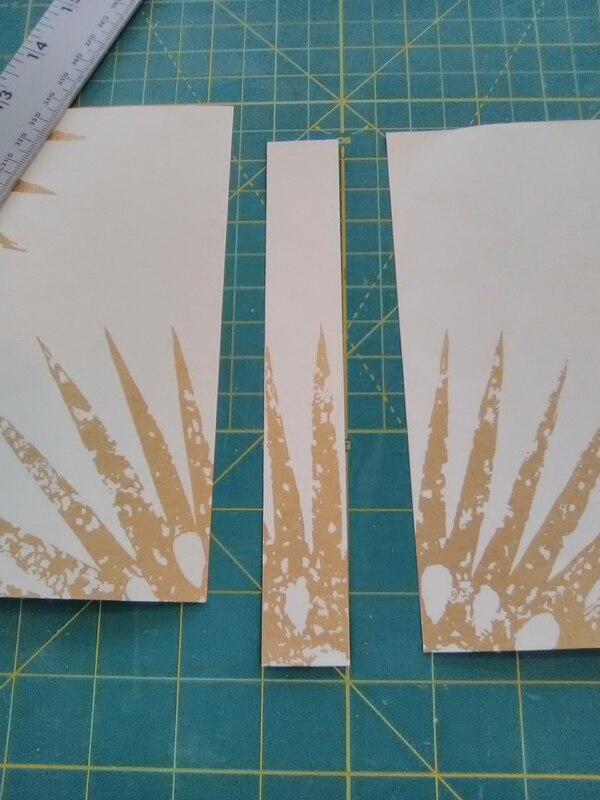 Today, if I had followed tradition and cut my final strip in a straight vertical line at the last corner, it would have resulted in a visible line of cut-off palm fronds. 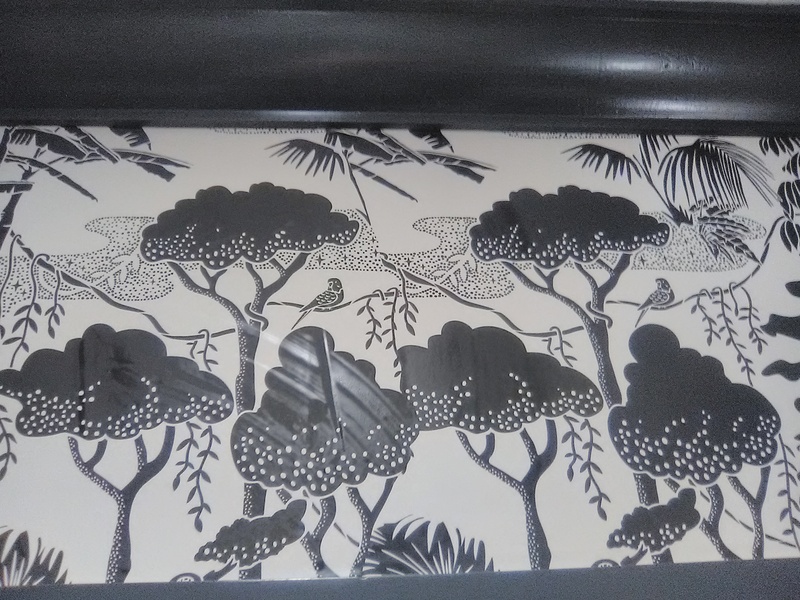 So what I did instead was to use a scissors and razor blade to cut around the green leaves on both the left-hand (original) strip and the right-hand (last) strip. 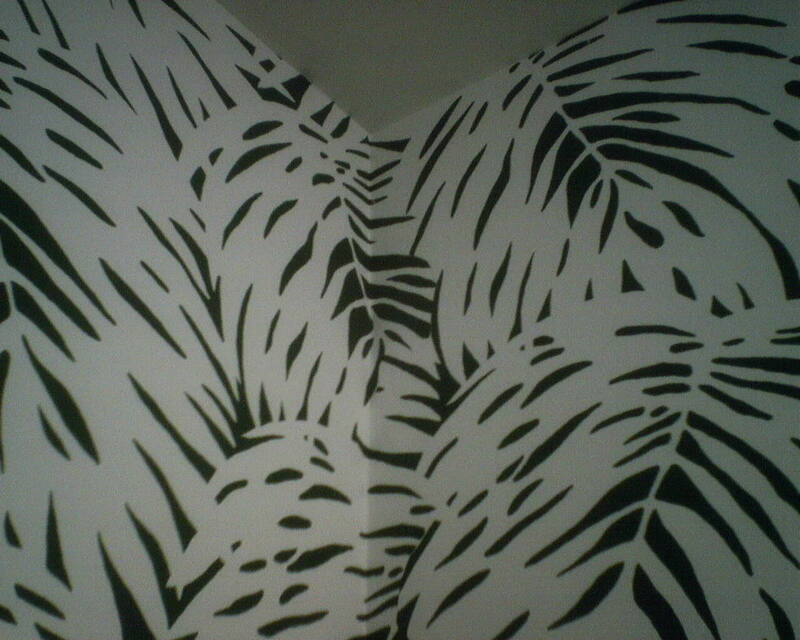 Because fronds were not cut off abruptly, they melded into one another, nicely obscuring the junction of old and new. The kill point is where the last strip you hang meets up with the first strip you hung. 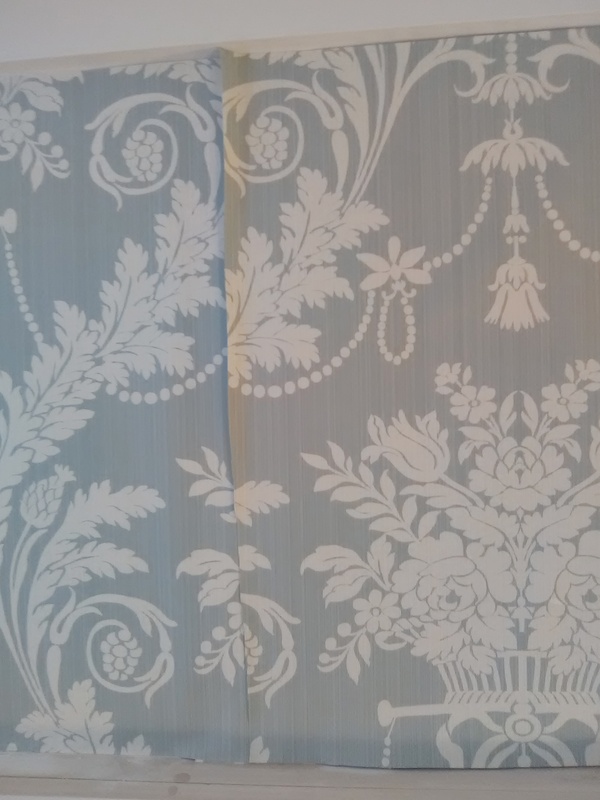 This virtually always ends up in a mis-match of the pattern’s design. 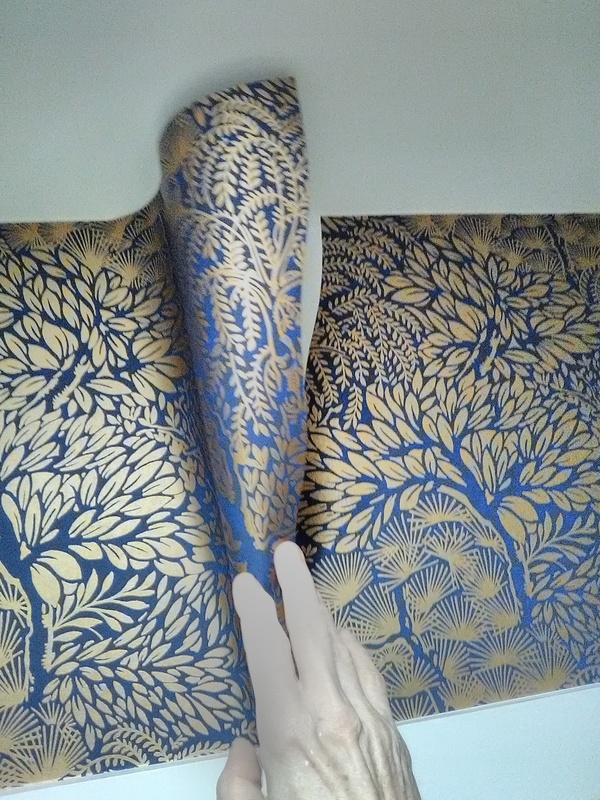 This is usually in a corner, and the paperhanger will try to place it in an inconspicuous location (such as behind a door). But not all corners are hidden behind a door. In such cases, and depending on the design, the pattern mis-match will be noticeable, even eye-jarring. Sometimes it’s possible to get creative and hide that kill point where it will be less visible. That’s what I was able to do today. 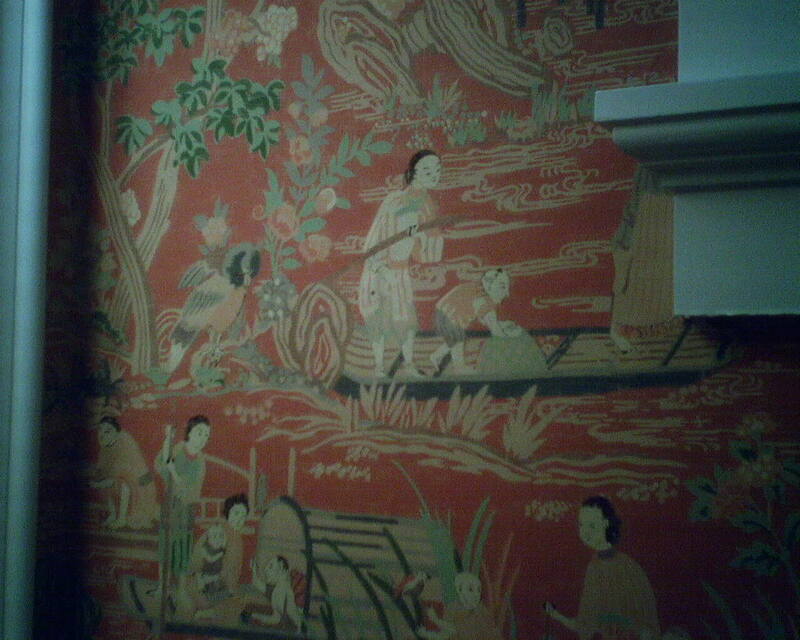 The first photo shows you the Chinoiserie pattern, so you get an idea of what it looks like. 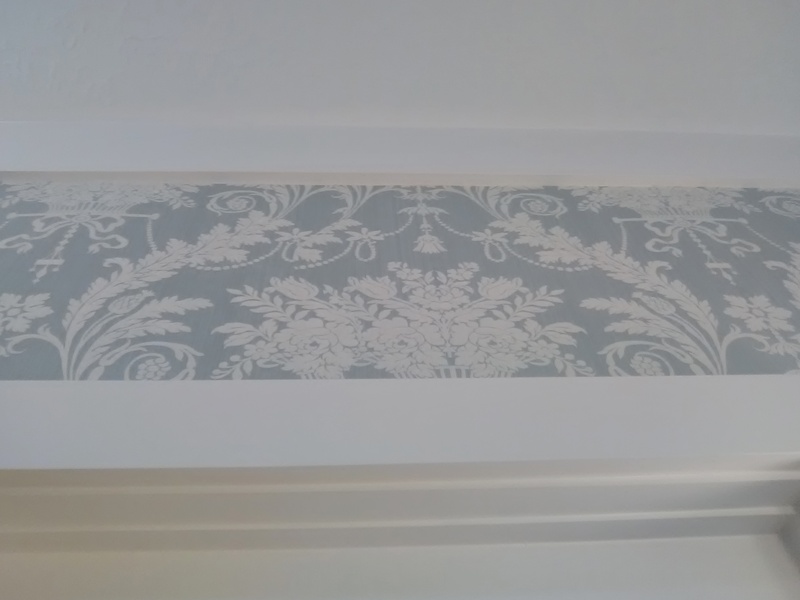 In this room, because all four corners were very visible, I wanted to keep the pattern intact in the corners. So I needed somewhere else to hide the kill point. 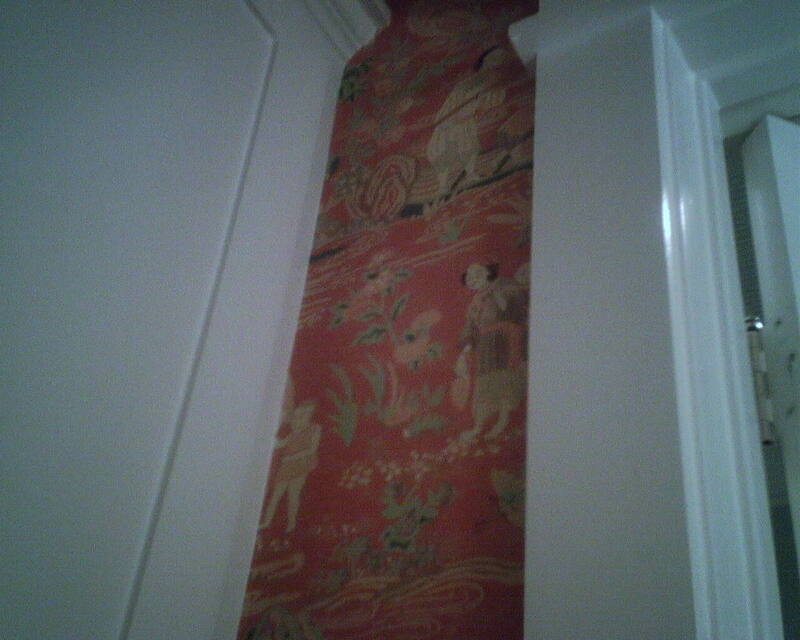 The room had a spot where the molding around the door came very close (6″) to the wall-hung linen cabinet. This was a good option to place the kill point, because it would be only 6″ wide, vs. my other option, which was a corner that was 5′ high. I’ll take a 6″ mis-match over a 5′ mis-match any day! 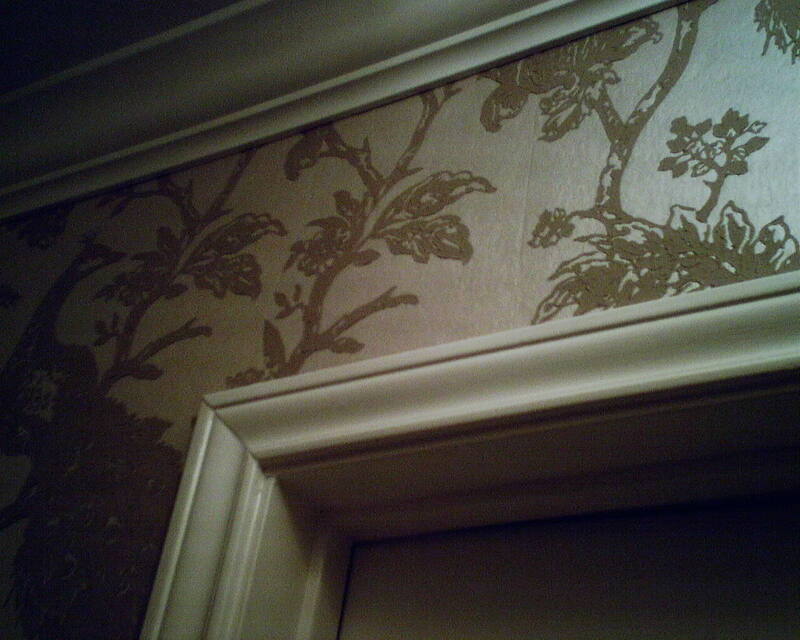 By manipulating the wallpaper pattern a little, it was easy to disguise the kill point and the mis-matched pattern. 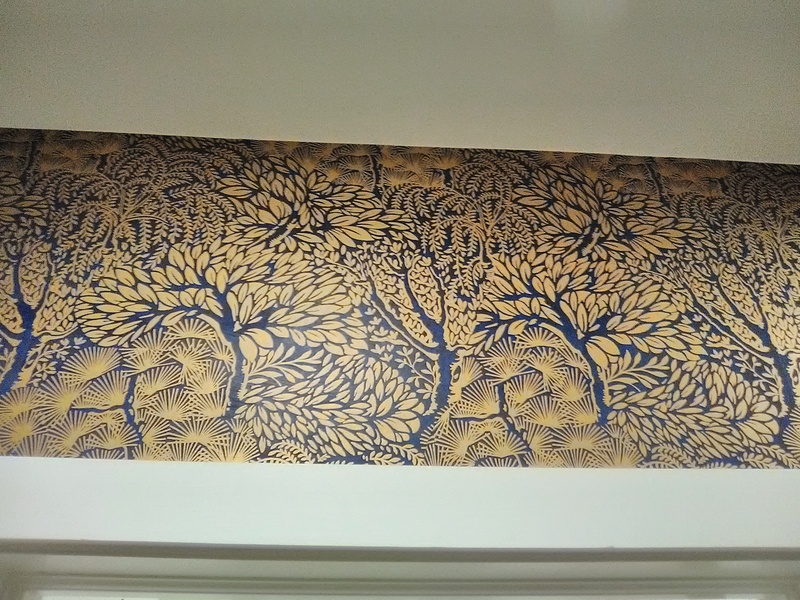 It’s there, in the second photo – but I’ll bet you will have a hard time spotting it.